We all know that smoking is bad. We see infomercials, blogs, and PSA’s about the detrimental effects of smoking, but we still have not gone into the depths of all the harm that smoking can cause to your body. We may know that smoking is bad, but may not be able to comprehend and explain why it is so. One of the most prominent effects of smoking is on a person’s teeth. Here is all you need to know about how smoking can damage your teeth. One of the most common symptoms or side effects of smoking is what is known as ‘smoker’s breath,’ which is scientifically called halitosis. Halitosis is caused by the leftover smoke particle in the lungs and throat. The chemicals that are found in tobacco can remain in the mouth after smoking, which can cause bad breath. Tobacco also dries out the palate and mouth, creating a chemical-infused environment in the mouth which leads to chronic bad breath. Periodontal or gum diseases can be caused by smoking tobacco. Smokers develop more tartar than non-smokers, which causes over generation of saliva. Your bone and soft tissues found in the gum are slowly destroyed, causing bleeding gums initially. When it gets worse, gums can break down, pulling away from the teeth and forming pockets. As more of the supporting structures diminish, the pockets deepen. Another one of the most prominent effects of smoking is tooth discoloration. Discoloration of teeth is caused by the tar and nicotine found in tobacco. Even though nicotine is actually colorless, it turns yellow when it mixes with oxygen, causing yellow teeth more quickly than you would think. After years of smoking, many heavy smokers complain of browning teeth. If a person quits smoking, the effect on their oral health can reverse to an extent, as bad breath can decrease after quitting smoking and gums do start to repair slowly. However, they will need to be twice as cautious to get their teeth cleaned, and regularly visit their Eagle ridge Fort McMurray Dentist. 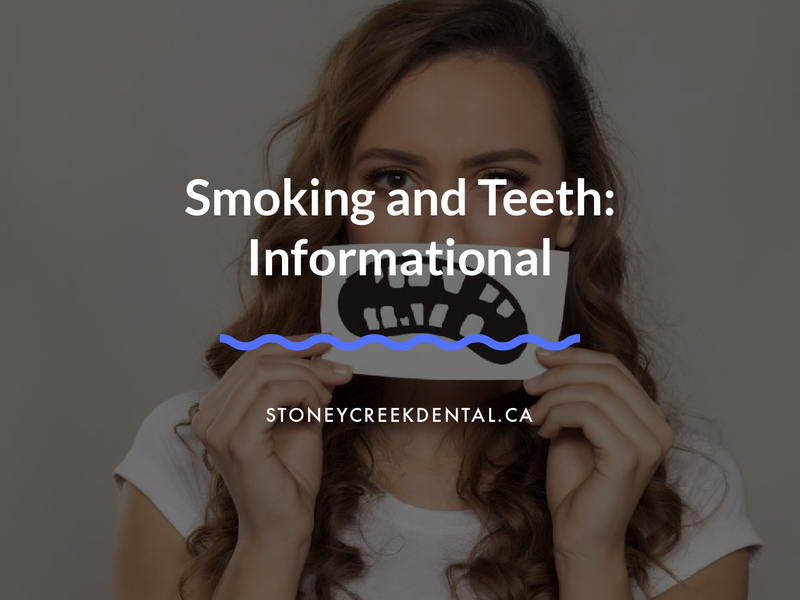 A Stoneycreek Village Dentist has to work twice as hard on patients who smoke, as they have a greater amount of plaque and tartar which takes a lot of intricacy and time to take out. Teeth whitening can almost instantaneously hide the effects of tooth discoloration caused by smoking. Teeth whitening can last up to a year, or at least a few months, which is good for those who struggled with tooth discoloration. Our team of expert Fort McMurray Dentist can make your smile brighter through teeth whitening in no time!